“Life is an improv.” That’s what Stewart Oleson, associate professor of journalism and broadcast journalism advisor, tells his students. How else could he explain his all-over-the-place career? Oleson started in radio, graduating from the University of Illinois with a bachelor’s in journalism. Though broadcasting was his passion, he went on to earn his J.D. from The John Marshall Law School in Chicago, which led to eight years as an assistant state’s attorney in Chicago and three more as a defense attorney. While still practicing law, he started a group called The Original Comedy Rangers, which consistently performed improv for 10 years in clubs throughout the city. 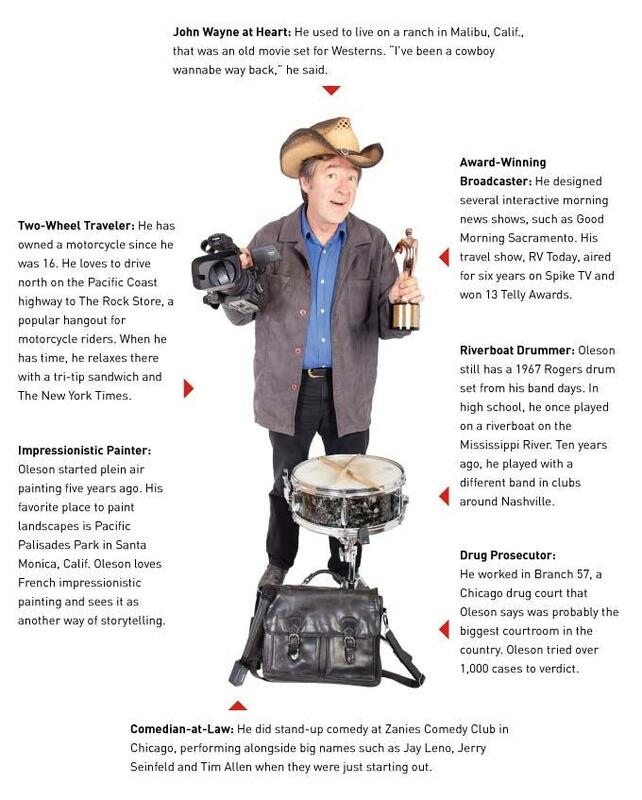 After leaving the courtroom behind in 1992, Oleson started several morning news shows and won 13 Telly Awards for his travel show, RV Today. He uses all these experiences to teach broadcast in his “fiefdom” at Biola’s Studio B, he says. Here’s your chance to get to know him. Take a look at "Bowling" by the Original Comedy Rangers. For more videos, view the YouTube playlist posted by member Craig Brolley. You forgot to capitalize "he," beginning the second sentence of the paragraph labeled "Two-wheel Traveler." Good eye, Captain! We fixed it.